… and other things you might say and hear in San Francisco. I coerced my good friend Ben into coming with me on a Lifestyles of Hollywood’s Rich & Famous Blah Blah bus tour the day after we arrived. With a brochure promising to take us through Laurel Canyon, along Mulholland Drive and through Beverly Hills, with sun shining and birds singing, it seemed, if anything, a great opportunity to see a bit more of the city. So I guess that’s one box ticked. But as soon as our open-top minivan rolled down Hollywood Boulevard, I realised this was not the tour for me. Was it our tour guide, with his knuckle-n-neck tatts, missing teeth and eau d’ganja cologne? Was it when we drove past the hotel from Pretty Woman (SPOILER ALERT : the one from the end, where JR’s getting ready to leave LA and Richard Gere drives down the street in the stretch limo and he climbs up the fire escape and they kiss ON THE LIPS and it’s really romantic?) three times in 25 minutes, with no other notable stops or sightings in between? Or was it when we stopped on Mulholland Drive to see the Bowl and take some snaps of the Hollywood sign? Ol’ Toothy stopped the car (on a pretty steep stretch of road) and jumped out to let us out the back. Except he forgot to put on the handbrake. So we all started rolling backwards down the hill. Thrills n spills in Hollywood, I tells ya! The icing on the cake was when we screamed around a corner and “OH MY GOD THERE’S A CAR IN GENE SIMMONS’ DRIVEWAY IT COULD BE GENE” honk honk honk!!!! The lady behind me said “Gene Simmons? Is that her in the car? Who’s she?”. Gene Simmons was not in the car. I’m not a huge KISS fan and even I knew it wasn’t him, but it didn’t stop Le Tooth from honking a little (a lot!) more and blocking traffic and whistling and yelling. By the end of the tour, I was glad we didn’t see anyone famous (despite being promised we would; if not on Rodeo Drive then ‘behind the wheel of any expensive sports car driving through the canyon’). It felt SO intrusive and revolting; like being at a human zoo. Yikes. That was a DOWNER! Let’s remember when Ben and I started rolling down Mulholland Drive and have a little chuckle! Good times coming soon, I promise! The only picture I took on the tour: Cher’s house. And I took it because – well – it’s a pretty impressive front gate. This entry was posted in world tour and tagged Beverly Hills, kale, LA, san francisco, urgh by wembolina. Bookmark the permalink. Starmaps etc are usually totally crap and are 50% false information. For instance, Meg Ryan does not own a home in LA anymore, she lives in NYC. 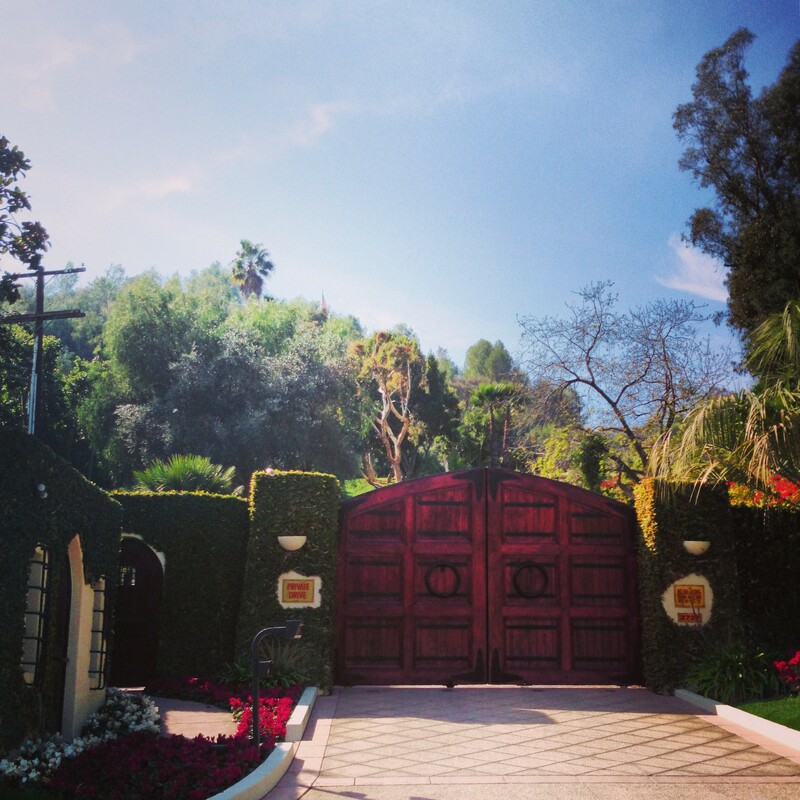 The home she had in LA is in Bel-Air and not visable from the road at all.